André Borschberg strapped himself to a single seat inside his aircraft, which is propelled only by solar energy, and took off from Brussels. He flew silently over Europe for twelve hours before landing safely in Paris in time for the largest international air show. With a degree in management science, Borschberg became the first pilot to test the world’s first solar-powered aircraft that can fly day and night. 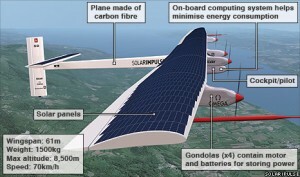 Never before could an airplane plane fly without fuel and fly as inexpensively as the Solar Impulse could. Powered by 11’628 solar cells that produce enough energy to fly the 1,600 kilogram aircraft, it runs on batteries that weigh a total of 400 kilograms – a quarter of the aircraft’s total weight. The CEO faced many challenges aboard the Solar Impulse, which has completed ten mission flights in total, five this year. “The major constraint in the project is storing enough energy in the lithium polymer batteries to fly through the night,” he says. “Producing enough energy to propel the airplane for long periods of time requires taking maximum advantage of solar energy,” he adds. finding clean energy solutions that can help to arrest the process of climate change. With 100,000 Swiss francs, equivalent to roughly $114,000, the current budget is calculated to include the existing airplane and an additional prototype that will be built over the next decade. 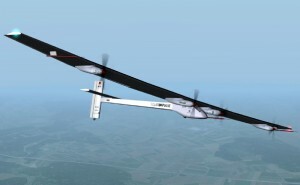 As the team finalizes design and conception earlier next year, the prototype will be assembled in time for its round-the-world flight in 2014.